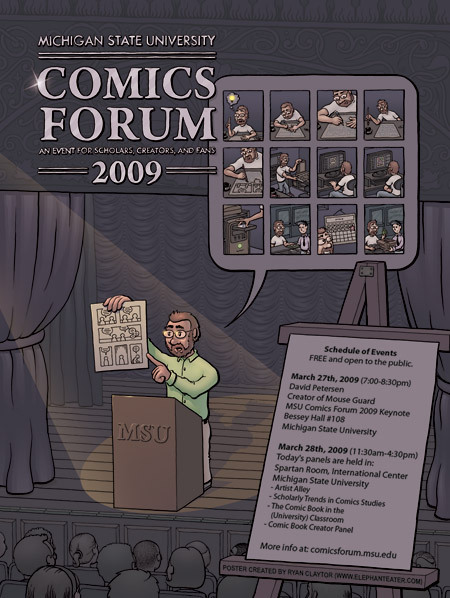 For those of you who didn’t get the word that this was going on, Michigan State University put on it’s second annual forum devoted to comics, hosting a variety of panels from accomplished comic book artists around Michigan. I was in attendance in the artists’ alley with about fifteen other creators, and I think it’s safe to say we all had a really good time. Besides the fact that this is a free event for both the artists (no table fees!) and attendees—it was an outright scholarly event, in contrast to the typical convention circus filled with vendors, washed up celebrities and caravans of costumed freaks (no offence to the freaks out there, gods bless ya’). What we had instead was mostly students and faculty, with a decent dose of local comic book fans. Most of the students that came by were taking courses that address (amongst other things) the impact comics have on social development and the traits comics exhibit as a unique form of expression. It was interesting for me because most of the students rarely read comics—if ever—so it was a great opportunity to not only expose them to why it is we artists do what we do and why we have such a passion for comics, but we also got some insight into the various reasons someone might not be drawn to comics. One guy in particular explained to me that though he’s an avid reader and loves art, the combination of text and images seems cluttered and cumbersome to him, repelling his interest in the medium—something I never would have imagined. Besides having a lot of fun and some really good conversations, this event was a great way to wrap up the Madness of March and ease into the ritual of the spring convention circuit. This entry was posted in Comic News, Events and tagged comics, Education, Events, MSU, Scholarly by Eric Wilmoth. Bookmark the permalink. If I’m in Michigan I’ll be there for sure!